This SM9 is my second. It's not in the best shape, but have v.nice typeface and all the special keys needed to write in "modern style", like: ; : ( ) ! ? " - _ % & and §. I could only wish for "@" for perfect keyboard. Apart from It's visual look - it works v.nice, there is no comparsion to Traveller in the back. It also is up for sale, if anyone interested. Details on demand. Right platen knob didn’t turn the platen. Paper guide (this metal thing keeping page from falling behind typewriter) was also bended. After I finish with Traveller, this one is in the line :) Rare Alpina typewriter, but with some malfunctions. Spacebar don't work, carriage won't advance to upper position... I'm hoping that this is minor issue, since it doesn't look to be damaged in any way. 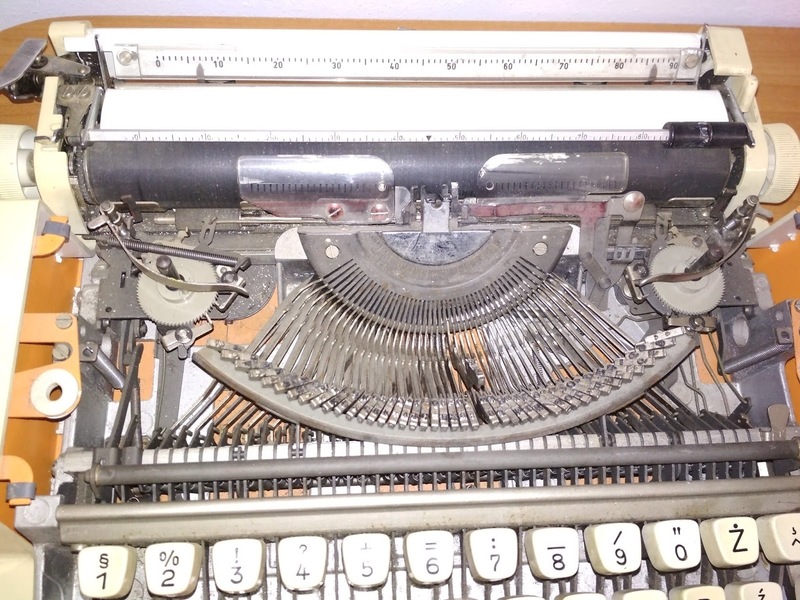 I'm planning to do some test with typewriters that I'm using. A series of practical tests and examples on various fields. 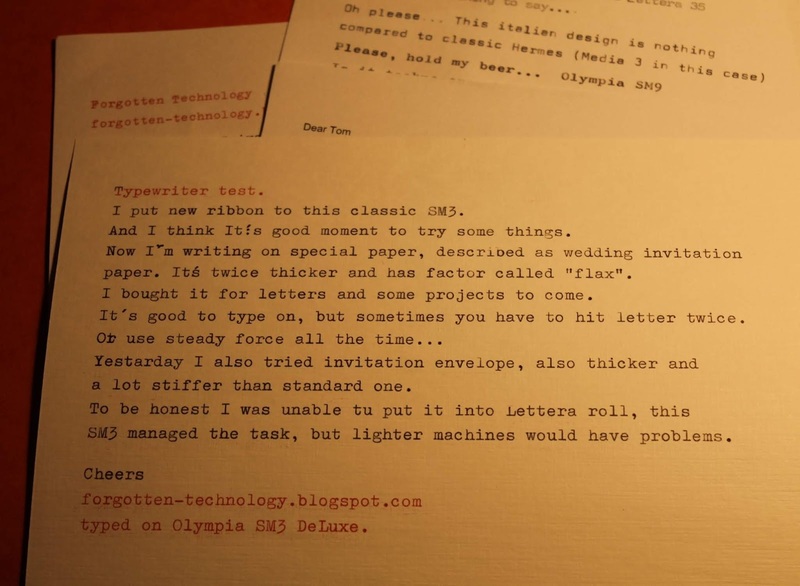 I called it simply Typewriter Testing, and here is first of it: with special paper. I'm keeping it for letters mostly, since they are quite elegant. I like the feel of it. We (I and son ;)) probably write a letter to the Santa on this paper this year. Maybe some other occasions You have in mind? 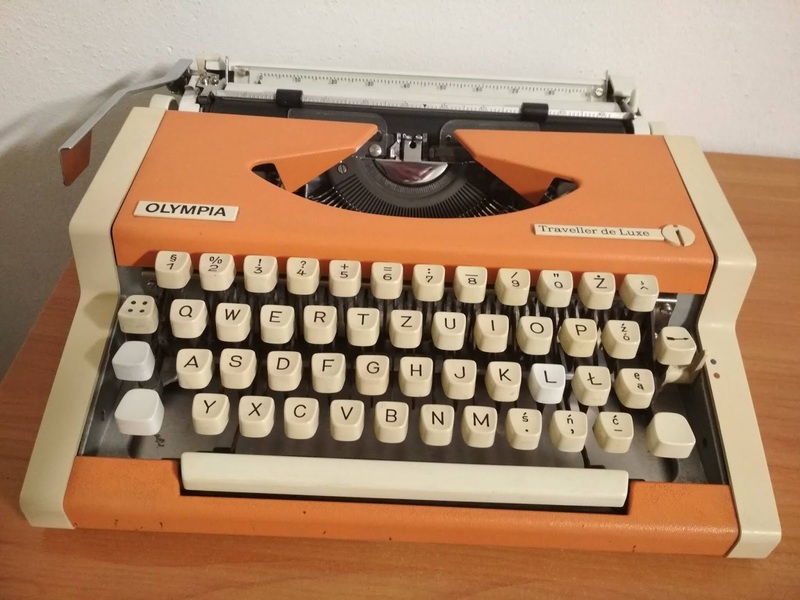 When I saw this typewriter on the auction site I was sure, this would be right typewriter for my son. 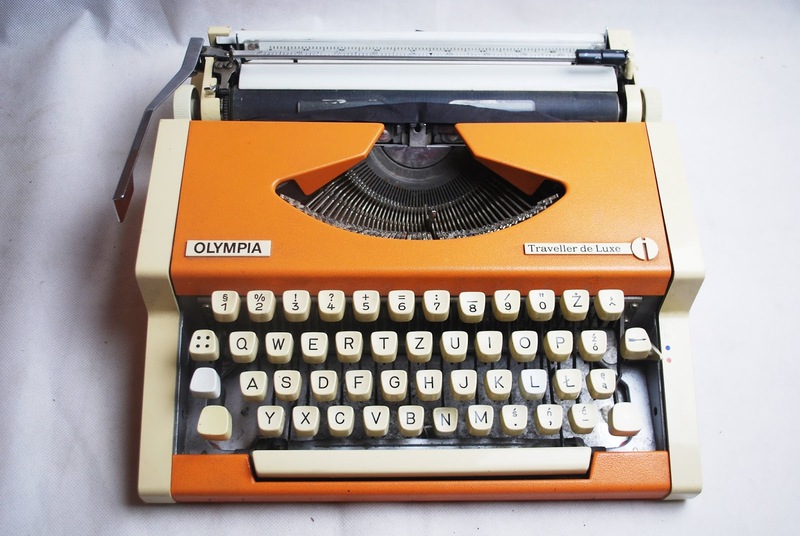 Olympia Traveller in Orange color, and with color selector! I must be honest that I didn't look carefully enough on the picture. I was fixed on color, and polish keys that was essential in this case. Plus it didn't look so bad in the picture. And it was quite cheap (15$ total). It was sold by pawnshop so I called them and ask about the piece. I found out, that it was little damaged, one letter didn't move. They give me discount from original price and I took the bate. I started to work on it the very day, and after 3 hours struggle I managed to fix mechanics (more than one issue with the letter) and began cleaning. Right now It's over 4 hours of work on her, and still few to go. For today I prepared something special. 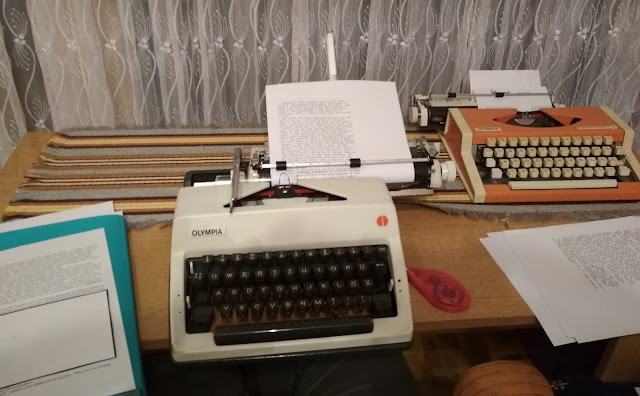 Since I have two identical typewriters made by different producers I couldn’t resist to compare them :) I had to clean them anyway! In history there is a lot examples of selling patents and produce different typewriters under many names. Sometimes very exotic. Ladies and Gentleman!! Facit Privat vs Łucznik Predom 1301! It’s actually Facit 1620, this particular sample was originally made in Sweden, but they also was produced in polish arms factory “Radom Łucznik” under “Facit” logo and “Made in Poland” sticker. They made them for Facit as subcontractor. But later they acquired licenses and made it as Łucznik 1301 / 1302 (with TAB), 1303 (wider rack), and 1304 (also with TAB). 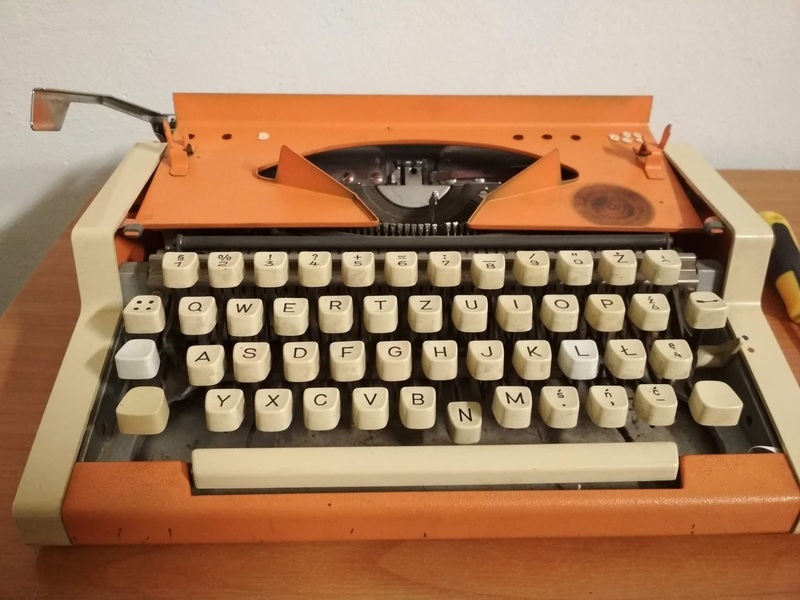 There are plenty of this typewriters on polish market :) I've seen them often with russian alphabet since market on the east side of Iron Wall was centralized. I can say, that weight is basically the same. Both have casing made from aluminium, and full metal body. The difference is in the color of metal, so I presume in Sweden they used better alloy - no question here. At the other hand both are in ex. condition with no sign of rust etc. What is different is quality of painting. Facit is smooth in touch, Łucznik had some small grudges that you can see and feel under touch. I believe used materials again are in favour of Facit. It’s not a surprise, since good quality materials was rare in soviet times. Chromes look good on both typewriters. In typing there is no difference in speed. I think Facit is a little softer, smoother. In Łucznik i don’t like “spring” noise, that are bit loud under fast typing. Facit have better springs as well, since they are not so noisy (although they do make some sounds). They both are fast, reliable and very enjoyable typewriters. I like the swedish design: simple, practical, modest, that fits “Soviet reality” as well. Both available on Etsy.com in my store!